In the old "Mission: Impossible" TV series, every episode began with the team leader reviewing the dossiers of each agent. ...The same thing happens whenever Agents of the New Order work together. Seasoned Agent Lord Mandelor got a small crew of Knights together and prepared to bring justice to the Kamio system. 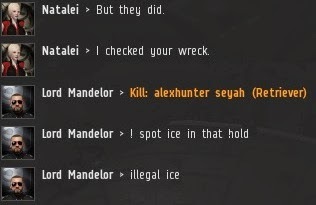 Natalei, the scout, detected illegal mining operations underway in the ice anomaly. Not yet vulnerable to faction police, the young Catalyst pilots moved into position. The miner, alexhunter seyah, convoed the team leader. Protip: If you have to ask, "is there a problem, officer? ", there probably is a problem. alexhunter's bio suggested that he understood, to some extent, that it was unwise to mine AFK. However, he showed his true colors when he began yellowboxing the Catalysts. Only carebears give the carebear stare. 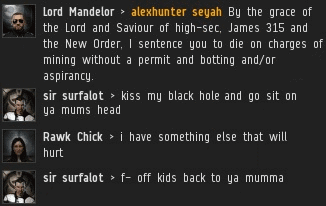 After careful consideration, Lord Mandelor sentenced alexhunter to death. The locals were stunned. The antimatter bullets began to fly. alexhunter became mute, but the other miners reflected on the virtues of the New Order. Airon Taiyou, who invented the "bio bumper sticker" a year ago, still mines in Kamio and is still happy with his permit purchase, which was recently renewed. When the dust settled, the Knights of the Order emerged victorious once more. Back in the convo, alexhunter demanded an explanation. He got one, but he didn't listen to it. He vowed revenge. Lord Mandelor invited his fellow Agents into the convo. alexhunter was dizzy with rage. Within seconds, he admitted that he didn't have a battleship after all. 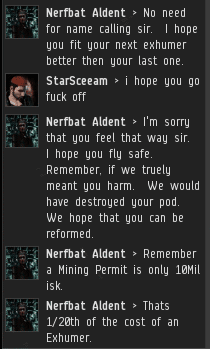 Just as quickly, he denied that he was "really" a highsec miner. Our heroes sought to raise a true EVE player out of the ashes of the dead Retriever. Was there any hope for alexhunter? Better? Good. From this point forward, I am assuming all readers are ready to get mad at CCP again. Earlier this month, I wrote about the ToS changes, which outlaw some forms of scamming. After further investigation, I learned that the new rules were much worse than I originally thought, so I followed up with an article for TheMittani.com. 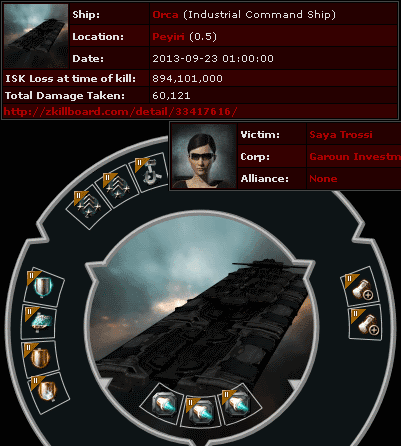 As I explained in both posts, one of the biggest problems with the new anti-scamming rules is that they could require CCP to get into the auditing business. 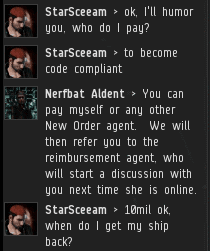 CCP would need to investigate in-game enterprises to determine whether they are, in fact, scams. Needless to say, this is a can of worms that CCP had good reason to avoid--which they did, until now. The optimists among us believed that CCP couldn't really have meant what the GMs were saying, and that CCP would never actually take it upon themselves to audit spaceship IPOs and the like. The pessimists feared otherwise. Now the speculation, both optimistic and pessimistic, can end. CCP has announced that it already plunged into the auditing game, in the worst possible way. "My personal take on it is this (note, this is not something we have discussed within the team): Events should be their own reward, but there are certain events that render a large impact on people and for these I do think there should be some kind of memento... Seriously, we won't be bringing back the old unique ships for events. We might give other stuff away that is interesting, but no Guardian Vexor, Opux Luxury Yacht, Fedthron, Impoc, SIR, etc, etc." Goliath opposed bringing back ships like the Guardian Vexor, because their value comes from their rarity. There are only a few Guardian Vexors in the game. 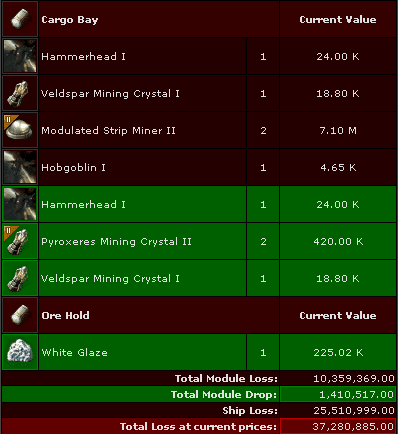 Some ships are even more rare: There are no Gold Magnates in the game. The Gold Magnate was awarded to the winner of a tournament years ago, and was destroyed. It's part of the history of the game. Navigator apparently disagreed with Goliath, and announced that CCP would re-issue certain rare ships, including more Guardian Vexors. They would even bring back the extinct Gold Magnate. Is this a bad idea? Many people think so. In the wake of the controversy, CCP reversed course, saying that they would replace the Gold Magnate and Guardian Vexor prizes with new unique ships. If it ended there, however, it would merely have sparked a disagreement about how rare a rare spaceship should be. A ruckus, sure, but not a publicity nightmare. 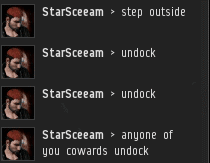 So CCP decided to take things one step further. 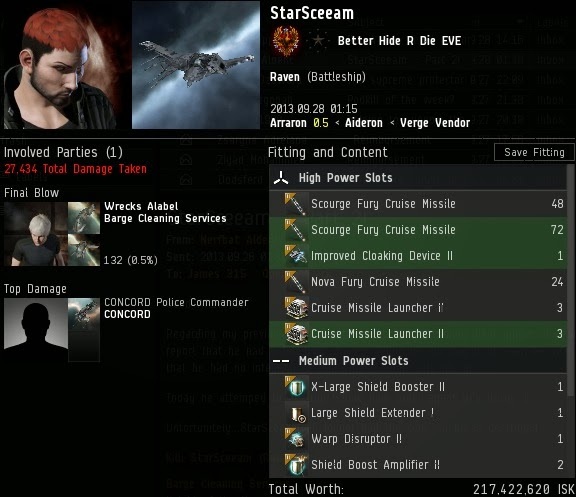 CCP decided to give the ships to SOMER Blink. You've probably heard of SOMER Blink, but just in case you haven't, I'll give you a quick explanation of who they are and what they do. SOMER Blink is a corporation that runs an in-game EVE lottery. Lots of lotteries, actually; they constantly run multiple micro-lotteries that finish within a few minutes each. 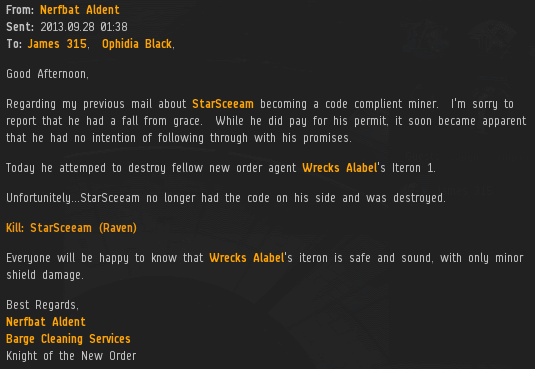 EVE players give isk to SOMER in exchange for SOMER credit, which they can use to buy tickets in the lotteries. If they have a winning ticket, they can claim the prize. Regardless of who wins the prize, SOMER takes a sizable chunk of the money (its "rake"), which it keeps as profit. According to its own statistics, SOMER has run over 5 million micro-lotteries, with over a quadrillion in total prizes. 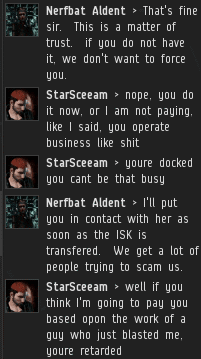 If true, SOMER has earned hundreds of trillions of isk, making them the wealthiest EVE organization of all time. They make the great nullsec power blocs look poor by comparison. And that's just assuming SOMER, unlike other in-game lotteries, never scammed. 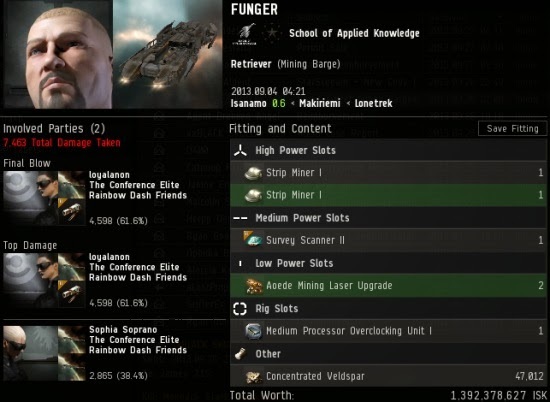 Even without any trickery, they can make massive piles of isk. 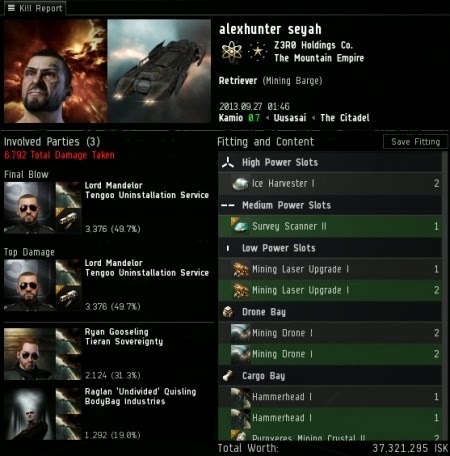 In addition to in-game riches, SOMER is also the most successful EVE RMT operation of all time. 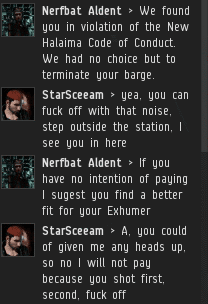 For the most part, RMT is against the rules, and anyone who gets caught selling isk for real money gets permabanned. 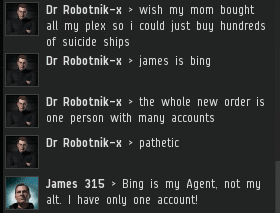 The distinction between RMT and PLEX is that RMT cuts CCP out of the transaction. But SOMER created an indirect form of RMT that allows CCP to get its "cut". You can purchase game time (GTCs) from CCP, or from certain authorized retailers, such as Amazon.com. SOMER's website allows players to click a referral link to buy GTCs from one of these retailers. The retailer then pays SOMER with real-world money. To encourage players to click its referral link, SOMER rewards them with SOMER credit. 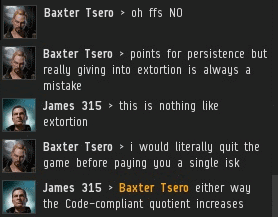 Since players can redeem the credit for in-game isk, the the money-to-isk cycle is complete: SOMER gets money for the referral, and players get isk from SOMER--if they use their credits to win something. 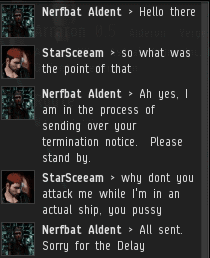 Meanwhile, CCP gets its piece of the action from the authorized retailer. No one knows just how much real money SOMER has made over the years through this process, but CCP is aware of the process and has approved it. The reason for SOMER's success comes down to automation. Because players purchase SOMER credit, which is not an in-game item, all of the lotteries can be run through their website. The buying of tickets, the determination of who wins, and the distribution of winnings is all done automatically. It's a botter's dream; macro-miners and market bots don't know what they're missing. 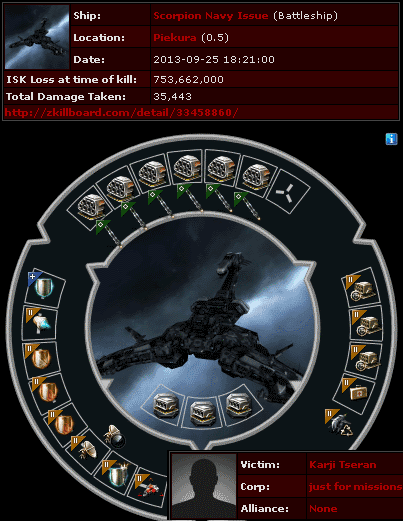 This setup would get SOMER banned for botting, except for one thing: When a player decides to cash out his out-of-game credits, someone in SOMER has to log into EVE and deliver the in-game isk manually. There's just enough player involvement to keep it legal. Due to its success, SOMER Blink has always been the subject of controversy. Some say that they scam, using shill accounts that win the lotteries more frequently than they ought to. SOMER's defenders point to the fact that its business structure would enable it to make huge sums of money anyway, so why cheat? No one outside of SOMER knows whether they cheat, or if they have used shill accounts in the past. SOMER's business model does rely on filling up all those millions of micro-lotteries around the clock, so there is some incentive to keep the lotteries active with shills. This would have been especially true in the early days, before SOMER became famous. Recall, for example, how Reddit's founders originally got their site rolling by using hundreds of fake profiles to submit and upvote content. Actually, it's not true that only SOMER knows if they've cheated or not. 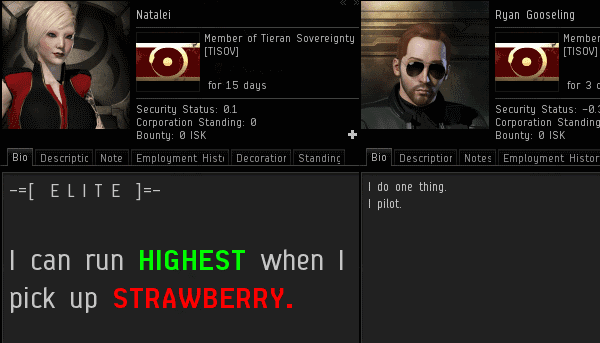 CCP knows, too, or so they claim. 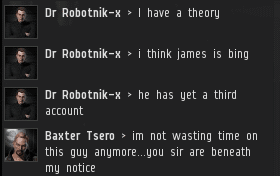 CCP Navigator posted an explanation for why CCP is giving SOMER the rare ships. 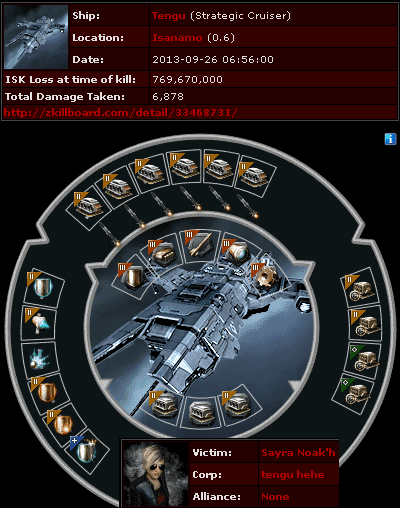 (Again, the Gold Magnate and Guardian Vexors have been replaced with new rare ships.) His post is worth reading all the way through, but I'll give you the highlights, along with my commentary. "Q6. So how can you be assured that SOMER Blink won't just make sure all of this goes to their alts? A6. I can't. Once again we go back to the trust issue. Having worked with SOMER for some time now I asked myself, 'Could they game this so they gets the cool stuff?' Yep, they absolutely could. 'Can we prevent it?' No, we absolutely can't." So, yes, by CCP's own admission, it's up to SOMER whether they want to keep these incredibly rare, valuable ships for themselves, and there's nothing CCP can do to stop them. 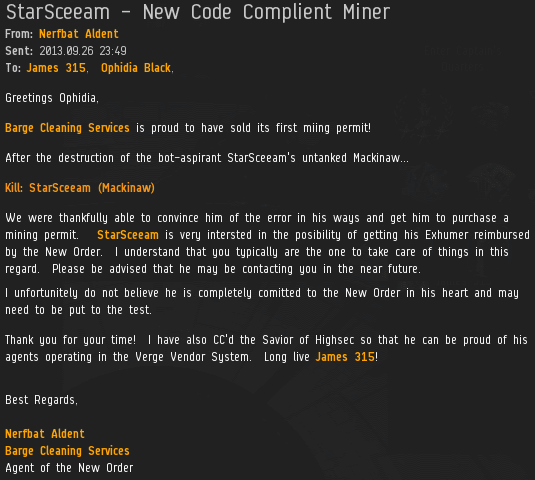 For all you scammers and legitimate businessmen out there, wouldn't you like this kind of treatment from CCP? 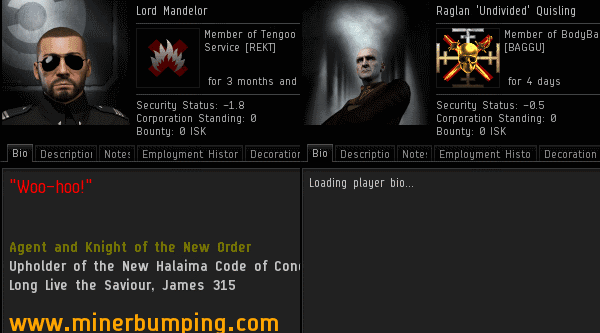 "For my part, I know the EULA forbids players from implying favor of CCP, I have trouble imagining that there isn't a similar rule forbidding CCP employees from showing favor towards certain players, and, well... handing an organization ships to give away in a for-profit lottery sounds a lot like favor to me." 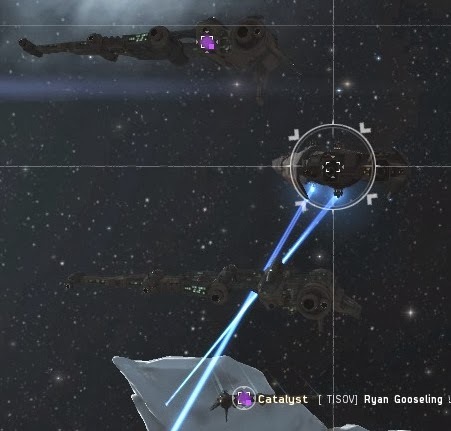 The spawning of unique in-game items and arbitrarily handing them to one group instead of anyone else--that rings a few bells to those of us who played EVE back in 2007. This raises the question of why SOMER Blink was granted the privilege. That's where this whole thing gets worse. Can of worms, meet can opener. "SOMER Blink have a history of being trustworthy and honoring every blink played without exception." Your eyes do not deceive you. CCP Navigator has just announced that CCP is in the auditing business. There's no more room for discussion about whether SOMER is really a scam, or if they cheat sometimes, or if they've cheated in the past. No shill accounts, no "nudging" the random number generators. 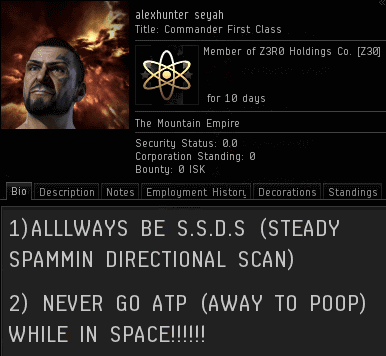 SOMER is pure as freshly-driven snow, and you've got that straight from CCP. Now that the old "is SOMER a scam?" controversy is over, does anyone want to play a few blinks? Before we all give our money to SOMER Blink, let's take a moment to consider the results of Navigator's audit. Remember when I said that SOMER claims to have run over 5 million blinks? Yeah, Navigator went back and audited all five million, apparently, even back from their early days. Don't believe it? Read again what Navigator said: "SOMER Blink have a history of being trustworthy and honoring every blink played without exception." Every blink played without exception. That sure sounds like all five million plus, doesn't it? Oh, you doubt whether Navigator could know this? Why else would he say that? 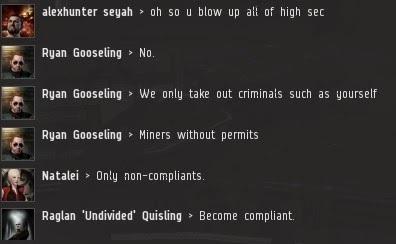 Of course CCP knows. 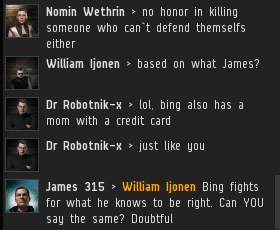 Who would know better than CCP? 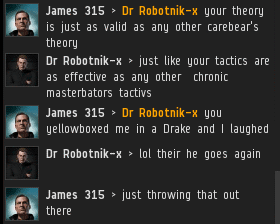 They know everything that goes on in EVE. Granted, the blinks are run through a third-party website. 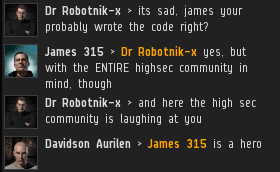 But CCP are computer geniuses, so you can trust them to know what they're talking about. 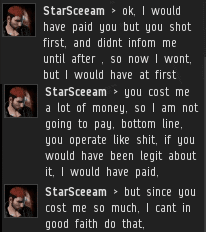 I wonder, which in-game businesses should CCP audit next? 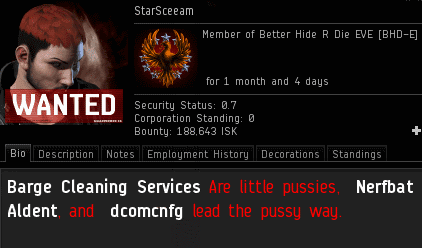 Perhaps you need to give permission to CCP before they'll audit you. 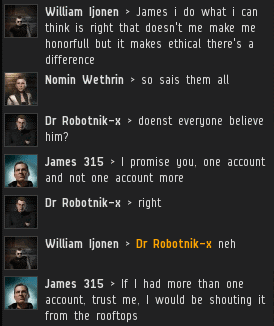 Surely CCP wouldn't conduct an audit and post the results on EVE-O without your being aware of it. "SOMER Blink have a history of being trustworthy and honoring every blink played without exception. With that level of trust we were looking at ways of expanding on that good will and allowing players to play for some very unique prizes in that trusted environment." 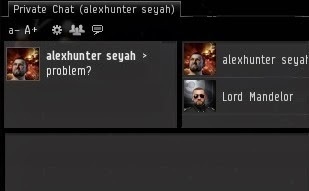 Why would CCP be interested in expanding on SOMER Blink's good will in the community? Why would they care about promoting SOMER, or helping SOMER in any way? Navigator doesn't say. But he does use the word "trust" a lot. Trust SOMER Blink. Trust them. Do it. "Q4. So you said earlier that SOMER Blink are trusted. Does that mean CCP is promising they will always deliver? A4. Not at all. What I am saying is that to date they have been 100% trustful and we expect that will continue." Once more, how can Navigator, as a representative of CCP, tell us that SOMER Blink has been "100% trustful" to date, without first conducting an audit? 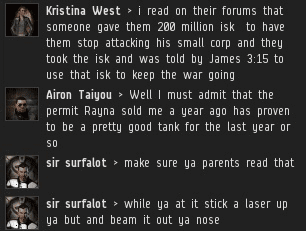 The only way I can read his comment is that CCP's audited SOMER Blink's business from start to finish, and that SOMER passed the inspection with flying colors. 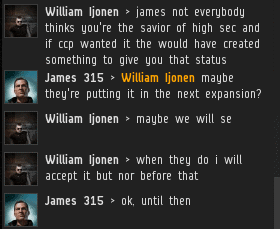 Oh, but CCP wouldn't promise that SOMER will always deliver--only that SOMER has delivered 100% in the past and that "we expect that will continue". "'Do I believe they would cheat to win it for themselves?' I genuinely do not believe they will. 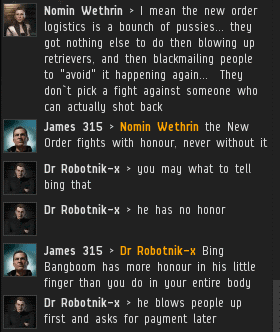 SOMER Blink have been one of the most philanthropic groups in EVE. It is safe to say that they can buy anything that is for sale and money is no object yet, despite that, everyone I have interacted with there is humble, gracious and honest. I honestly believe that this blast will be fun and fair for all who enter." More love for SOMER. One thing pops out at me: "SOMER Blink have been one of the most philanthropic groups in EVE." Navigator has an interesting notion of what philanthropy is. SOMER runs a for-profit business. Not only is it the most profitable business in-game, it's also making money out-of-game. It's almost as if Navigator just wants us to really, really likes SOMER for some reason. "Q3. How do we know we can trust Fansites and third parties to operate fairly and independently? A3. We have worked with a lot of third party sites in the past such as EVE Radio, BIG Lottery and SOMER Blink. These entities (and others of course) have demonstrated a solid history of trust and reliability. As a result, we can verify that they have been straight and true in their dealings and this should be encouraged... We would also like to address the role of SOMER Blink in this change. They have had three years of constantly delivering on every blink, blast and bonk they have organized." So there you have it. CCP has audited three years of SOMER's business transactions, including "every blink, blast, and bonk" they ever ran. Oh, and apparently they've audited EVE Radio and BIG Lottery, too, and they're totally clean. 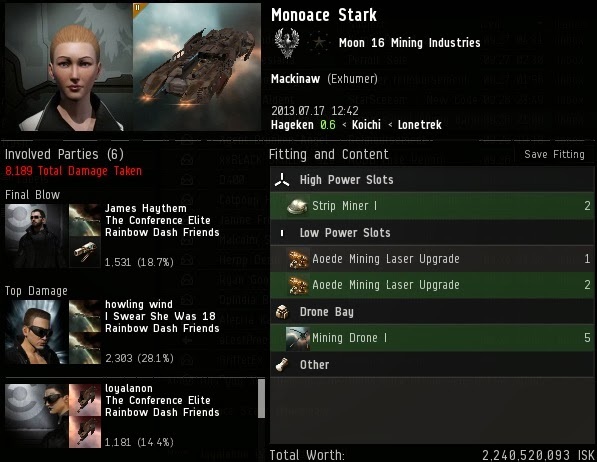 Amazing how busy CCP has been. "Q7. So I am a Fansite, can I have a Vexor/Magnate to give away? A7. Maybe in the future you can but for now we are testing the waters and looking at how players react... Will we always use SOMER Blink? No, we will want to share the love around. You, as a fansite owner and content provider, will need to display a level of trust and virtue way above the norm." 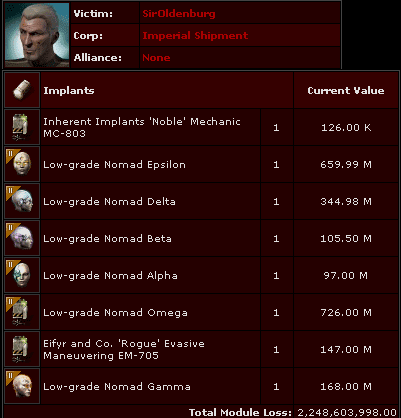 I know what you're thinking: Could CCP give free stuff to the New Order in a future "event"? MinerBumping isn't an official EVE fansite, but it's certainly a content provider. And who can doubt our level of "trust and virtue"? 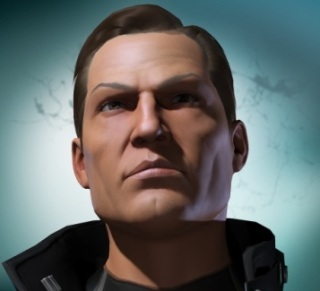 I'm confident that if CCP conducted an audit of the New Order's finances, they would find that our 126,000+ shares (which, like SOMER's credits, are not an in-game item) are handled with a level of trust, trustfulness, and trustworthiness that eclipses even the 5,000,000+ blinks, bonks, and blasts that they inspected for SOMER. All you scammers and legitimate businessmen out there, take heed. If you want to succeed beyond your wildest dreams, make sure you get audited by CCP and have their official seal of approval planted on your business and/or scam. 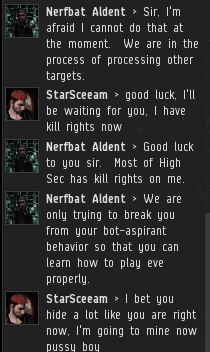 It's a brand new day in the world of EVE.